Over the past few months, I've been incredibly thankful for my wardrobe doors. Sounds weird but they've done an amazing job of keeping my clothes from spilling onto the floor. I've got into the really bad habit of stuffing things in and hoping the door shuts again. 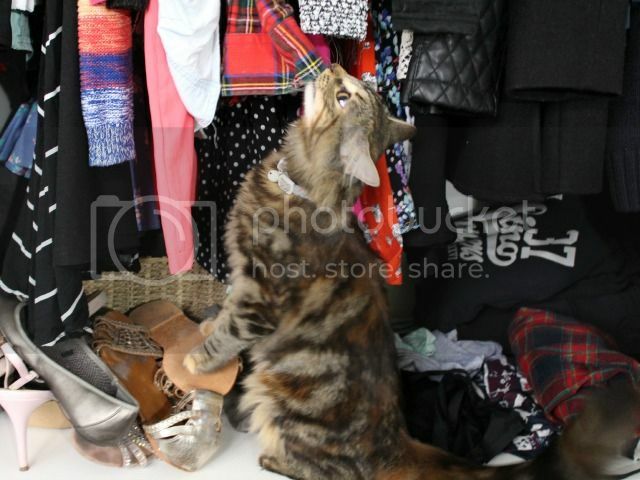 MoneySupermarket have been helping out with those annoying tasks (...like organising your wardrobe). Why? Because... Like finding a credit card with a free balance transfer, there are loads of these little niggling tasks that we just keep putting off, which is why MoneySupermarket is getting involved and offering you the chance to ‘balance transfer your life’ – no matter what the little chore is. 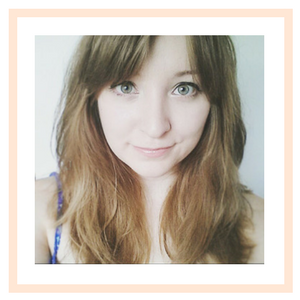 MoneySupermarket hooked me up with some expert advice from pro-organiser, Rachel Papworth. Having some guidelines and a step by step process to follow definitely made the task in hand a lot less daunting. I began by clearing out all my clothes, shoes and accessories and giving the shelves a good clean. Next was deciding what was to go back in and exactly where it was going. I organised my hanging clothes by garment type, making searching for things easier. My shoes made their way to the top shelf and all of my flats are now contained in their own storage bag. I was pretty ruthless with the categories I sorted my clothes into. Things I was going to keep, bits for the charity shop and a pile heading straight for the bin. Rachel had a top tip for those pieces that you're unsure of what to do with. If you can imagine leaving it behind in an emergency then get rid. If it would be one of the things you'd save then keep it. It's safe to say that anything I found still with the tag attached went into the charity shop pile! Although it's tempting to layer tops and cardigans onto a single hanger, only use one hanger for one item of clothing. It makes it easier to find things, which is essential for bleary-eyed morning outfit planning. Make sure broken or flimsy hangers are binned or recycled. I've never been one for storing woolly jumpers under my bed and Rachel recommends keeping everything in your wardrobe. I did have a re-jiggle of my summer holiday items - they're now in a box on the bottom shelf. They're still easily accessible but are kept out of the main compartment of my wardrobe. 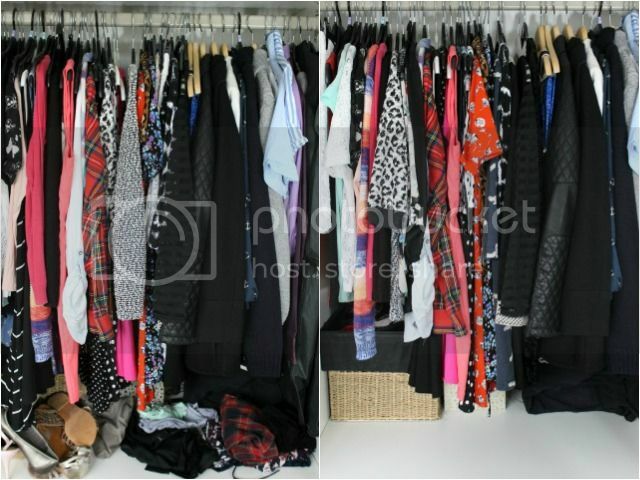 Rachel insists on taking a before and after shot of your wardrobe so you can see what you've achieved. This can serve as a reminder not to get all messed up again, and also to help you prevent bringing clutter back into your wardrobe. I'm determined to keep my clothes nice and tidy from now on. The whole experience has been therapeutic and having a clear out is just what I needed. I'm even tempted to bring in a 'one in, one out' policy in the future! Written in collaboration with MoneySupermarket.com. Yay! 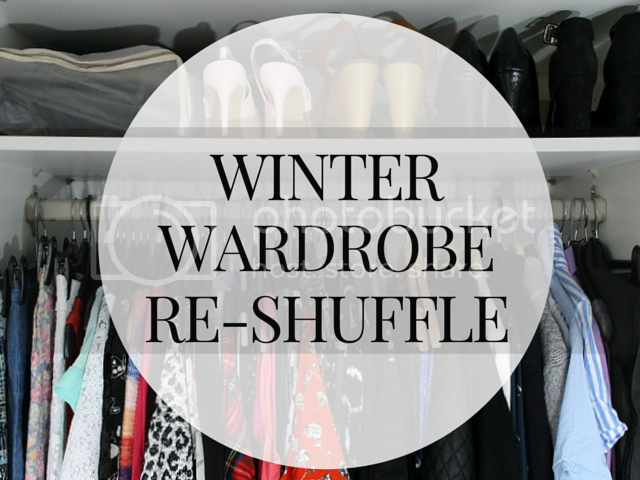 Well done on your winter wardrobe reshuffle, Catherine. I'm glad you found my guide helpful. Your readers can find lots of useful tips at http://mygreenandtidylife.co.uk They can even download a masterclass in decluttering, absolutely FREE.